In the many conversations we regularly engage in, there is always the risk that we will be confronted with an unfamiliar term or concept. When this happens, we are faced with two options: 1) Ask the speaker what it means. B) Don’t ask about it — try to infer the meaning from context and perhaps make a mental note to look up the word or concept later, consigning oneself for the time being to an uncertain or incomplete understanding of the speaker’s message. While choosing the first option seems like the best and most reasonable way to ensure that one understands what the speaker is saying, there are a number of reasons that people might opt not to ask. Probably the biggest reason is that it requires one to admit ignorance of the word, thus admitting the speaker’s intellectual superiority in the matter, and risking exposing oneself to ridicule if the word is considered common knowledge. People also might not feel at liberty to request a definition (such as if the speaker is the listener’s social superior or is addressing an audience) or they might not trust the speaker to accurately define the term. Regardless of why listeners might remain ignorant about a word’s meaning, in doing so they grant their speaker a special immunity from criticism or disbelief. Most listeners, when confronted with an unfamiliar word, will by default assume that it was used correctly, or at least refrain from questioning the validity of its usage. If someone were to say that a Diplopod is a type of Chelicerate, most speakers would make no objection unless they knew what those terms referred to. While it seems like common kindness for an ignorant listener to give their speaker the benefit of the doubt in such cases, the trouble begins when speakers learn to exploit this tendency, dazzling their audience into believing falsehood by using intentionally indecipherable language. Geoffrey Chaucer’s The Canterbury Tales, harshly critical of the clergy on a number of fronts, writes of this tendency of medieval clergy-members to abuse their education, especially their knowledge of Latin, to deceive or swindle the uneducated masses. The clearest example of this is during the Pardoner’s Prologue, in which the corrupt Pardoner, a clergyman licensed to collect money and grant indulgences on behalf of the Church, — is describing the many rhetorical techniques he uses to manipulate people into paying him (for more information on Chaucer’s Pardoner and his relevance to the modern day, check out Zach Prephan’s post). He boasts of being able to use his knowledge of Latin to lend his sales pitch an (arguably undeserved) air of authority and legitimacy, precisely because the language would be unintelligible to most. While his “theme” which he mentions a few lines earlier — “Radix malorum est cupiditas” (1; VI; 334) [“the root of all evils is greed’] — is indeed a valid biblical quote (1 Timothy 6:10), his use of Latin rather than the vernacular language gives him complete control over the interpretation, as few, presumably, if any, of his audience would also speak Latin. While most widely-used languages are used for their ability to reach a wide audience, the ubiquitous use of Latin among the clergy seems more readily attributable to its exclusivity. It was frequently argued, especially during the Reformation by religious dissidents such as Martin Luther and John Wycliffe, that the Catholic Church was able to teach false doctrine without facing scrutiny because so few people spoke Latin. Reformation leaders called for widespread distribution of vernacular translations of the Bible, which Catholic Church leaders had, at various times, refused to allow. The Church, they believed, had exploited the exclusivity of the Latin language for its own agenda, preventing the common person from reading and interpreting Scripture for him or herself. If few outside of the clergy could read Scripture, few could pose a legitimate argument about Scriptural teachings against the established Church. Furthermore, as the Pardoner suggests, the use of Latin likely evoked an emotional response of awe and reverence. To non-Latin-speakers, the language (which would most frequently be heard in a religious setting) would probably take on an arcane or mystical quality in the context of religious ritual which the same words spoken in vernacular would be less able to evoke. Referring to the medieval clergy’s use of Latin, Kathryn Rudy writes “[l]inguistic exotica suggest mystery and superhuman provenance, something more elevated than a common, Earth-born origin”(2; p. 12). This effect certainly persists today — if the magic spells uttered by the characters of J.K. Rowling’s Harry Potter universe were based on English rather than Latin or Greek, would they sound nearly as cool? While it is probably overly-cynical to cite monopoly over theological interpretation and potentially-manipulative emotional effects as the primary reasons for the Church’s preference for Latin, it seems very likely that these contributed to it to some degree. Another example of Latin’s special gravitas occurs in the “Nun’s Priest’s Tale,” when the protagonist, a rooster named Chaunticleer, quotes “Mulier est hominis confusio(1; Fragment VII; line 3164)” to his wife. The comedy of this is that he later says that the phrase means “‘Woman is mannes joye and al his blis’(1; VII; 3166) while a more correct translation of the Latin reads “woman is man’s confusion.” Again, a character turns to Latin to secure a rhetorical advantage and establish a sense of authority. Chaucer, however, seems to satirize this practice by suggesting that neither party actually understands Latin (or, if Chaunticleer is aware of his mistranslation, that he intentionally uses the Latin phrase to argue something almost opposite to its actual message). Just because something is said in Latin doesn’t mean it’s true, Chaucer seems to suggest. While vernacular translations of the Bible did become widely available and, with the Second Vatican Council, the Catholic Church ultimately allowed the saying of Mass in vernacular languages, criticism regarding intentionally-inaccessible language remains prevalent, though now focused on secular authority figures. Namely, the development of increasingly-specific jargon for academic fields has occasionally come under fire for allegedly being intentionally difficult to understand. Often derisively called “technobabble,” defined by the Oxford English Dictionary as “incomprehensible or pretentious technical jargon (3),” scientific or academic authority figures are criticized for using excessively-difficult or esoteric language for personal gain, often to appear more knowledgeable or to hide their ignorance on a topic. At its extreme, technobabble can easily be almost as incomprehensible as an unfamiliar language, as the below video demonstrates. Sokal suggests the editors of the journal were deferent to the “cultural authority of technoscience,” in that they trusted in Dr. Sokal’s reputation as a scientist to believe that the incoherent paper made sense. The mention of the “cultural authority of technoscience” being trusted in this manner is interesting, as it seems to closely recall the aforementioned trust placed in the medieval Church to interpret Latin texts. Is technobabble the new Latin, and the representatives of technoscience its interpreters for the unlearned masses? Obviously this is a very limited comparison for a number of reasons — the knowledge required to understand technical jargon is widely accessible on the internet and no longer reserved for those of specific social classes, and the complex and specialized nature of the language used serves an important purpose and can’t easily be translated into “vernacular” (although some have tried, such as Randall Monroe in his bookThing Explainer, which explains various scientific concepts using only the 1000 most commonly used English words(4)). However, as Chaucer shows, people have exploited exclusive language for personal gain for centuries, and likely will for many more. While mistrusting scientific consensus without reason is a recipe for becoming a flat-earther, perhaps we should be a little more skeptical about the many things we are told and accept without understanding, especially if personal gain for the speaker is on the line. Luckily, unlike in the Middle Ages, Google (or Bing, if you’re a determined nonconformist) is only a quick pocket-dig away for many of us. While trust may be the basis of a functional society, we must be aware of who we are placing our trust in, and ensure that we, like the Pardoner’s audience, are not being manipulated. (1) Chaucer, Geoffrey. The Canterbury Tales. Translated by Robert Boenig and Andrew Taylor, 2nd ed., Toronto, Broadview, 2012. 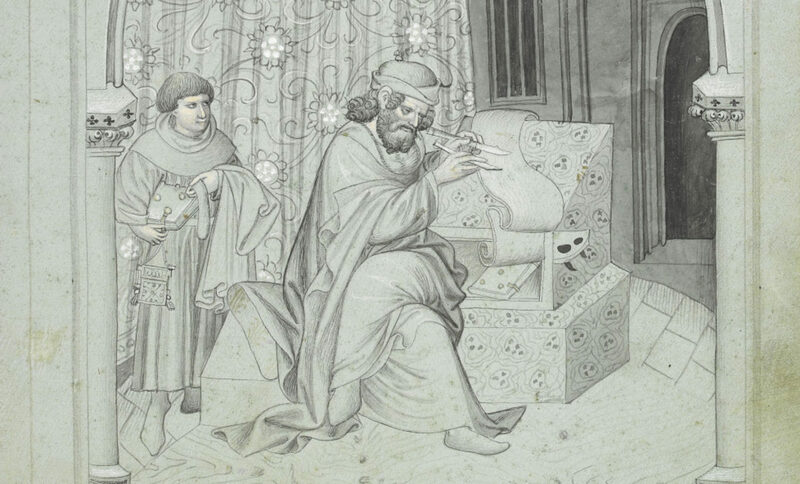 (2) Rudy, Kathryn M. Rubrics, Images and Indulgences in Late Medieval Netherlandish Manuscripts. The Manuscript World ed., vol. 55, Brill, 2016. Library of the Written Word. (3) “techno-, comb. form.” OED Online, Oxford University Press, March 2018, www.oed.com/view/Entry/198460.